HTC is diligently releasing its performance each month to the public, unlike most of the other companies which only do it quarterly, for which we are grateful. Its November slump doesn't paint a pretty picture, though, as we see almost a fifth - 19.6% - shaved off its same-month revenue in 2010. Then HTC earned $1.27 billion versus $1.03 billion last month. Considering that just in the last quarter the Taiwanese managed to handily beat the 2010 year-on-year performance, and that has been a trend for a while (36% increase in October vs October 2010), the drop in revenues is even more stunning. Despite that HTC issued a profit warning citing increased competition in the high-end market, which is its bread and butter, the diminishing revenue should raise some strategy questions in Taipei. The verdict from the patent infringement lawsuit with Apple got postponed from today to December 14, and the case has not been affecting anything in November except legal fees and the possibility that HTC will not shell $300 million to buy S3 for patent reasons. Legal spats with Apple aside, the top US smartphone seller is just not selling as much handsets as last November. It has been criticised by analysts lately for its unibody chassis becoming too look-alike. Adding just Beats Audio headphones and branding to a regular Sensation in the case of the XE, or overpricing the Sensation XL with its single core processor and no expandable memory apparently don't help the cause either. Even the all-new HTC Rezound with its dual-core silicon, HD screen and LTE connectivity has been picked at for having uninspiring design. We'll see what December brings, but the competition is indeed fierce in the high-end smartphone market and the performers this holiday season are shaping up to be Apple, Samsung and Motorola. Still, as long as the profit margin hasn't dramatically changed, HTC will probably weather this period fine, until its new crop of handsets like the HTC Zeta superphone shows up. Sensation XL is garbage.. makes no sense at all..
IMO samsung killed it this year. 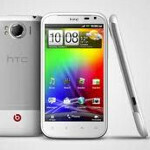 HTC just couldnt compete, I had the desire in 2010 - that was the best phone that year. I was expecting them to keep the desire as a flagship and improve it (like the s2) but they released the desire s (pointless) and the sensation just wasn't good enough compared to the s2. Samsung have had a fantastic year and they are number one at the moment in the android competition.